As contractors and construction folks, we’re living in some exciting times when it comes to technology for making our jobs easier, faster and even more profitable. When old ideas become new solutions that help solve problems on the jobsite, we want in on it. However, in our haste for new things, we might be building a house without a proper foundation. One great example is the new digital inventory management applications arriving in our industry. You’ve probably seen the ads for things like beacons, trackers and apps popping up online or in the various contractor publications you read. The manufacturers of the new technologies are some of the most reputable toolmakers in the business. Big industry players like Milwaukee™, DeWalt™, and Bosch™ are getting attention because of their brand’s trusted reputation for making reliable tools. Often though, the attention this technology generates turns to disappointment as contractors discover that the technology isn’t quite living up to the promises yet. Or worse, they realize the solutions aren’t solving the real problem that their business is facing when it comes to tracking tools – accountability. Before going deeper into this, it’s important to understand how these technologies work. Here’s a general overview. 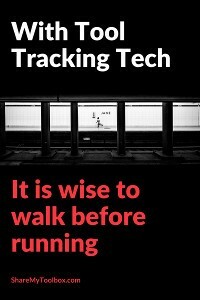 There are two basic components to all of these tracking technologies. First is the hardware that is transmitting a signal and second is software or an app that is providing the information to a user. Powered by either Bluetooth® or GPS technology, tool tracking beacons are designed to transmit a signal that can be used to locate an item. Bluetooth beacons transmit the signal through the short-range Bluetooth communication capabilities of your phone or tablet. GPS beacons transmit a signal directly to a telecom network and therefore do not need a phone to be in range in order to transmit. The distinction between GPS and Bluetooth beacons is important, as each has its own set of benefits and drawbacks. These tend to be what we imagine when thinking about a remote tracking device. GPS Beacons self-broadcast a signal over telecom networks and are considered the most reliable predictor of tool location. Unfortunately, since they are broadcasting directly to a mobile network, beacon technology requires a distinct data contract with a telecom provider to be paid monthly for each beacon – meaning there’s a monthly cost for each and every beacon you plan to use. Additionally, the beacons usually require a connection to a power source to create the transmission. Lastly, new battery technology is starting to allow these to be self-contained units, however they’re often prohibitively expensive since the technology is so new. Bluetooth beacons are basically homing devices that can be tracked from your phone or tablet. The beacons transmit a local “ping” which phones pick up using their built-in Bluetooth receivers. This is the same technology that allows your phone to send music to your car – or enables a wireless headset to communicate with your phone. Reliability is the issue here. The fact is, these beacons are only as reliable as the Bluetooth on your phones. This reliance on the phone’s location tracking, battery life and ability to keep Bluetooth active is where most of the problems around beacon technology begin. As mentioned, the hardware is only one half of the tracking technology. The other half is the piece of software, or App, where the user will “see” the information delivered by the beacons. An App provides visibility into the location “pings” from the hardware. The App is also where the map is loaded and where the last known location is displayed. Currently, most of the free software that comes with the beacons is rudimentary. It displays the beacon information but not much more. It’s clear that digital tool and inventory tracking functionality is important and will continue to evolve into a necessary component of knowing where your tool assets are at any given time, but evolve might be the keyword here. The reviews on these beacon technologies keep pouring in and besides the usual set-up and configuration frustrations that go along with any new technology, users have shared a few consistent problems. 1. Bluetooth requires a phone app to run all day, often draining a mobile phone battery in a matter of hours. 3. External beacons can be easily removed or tampered with so it’s not an effective theft deterrent. Plus, batteries need to be routinely changed. If a beacon battery dies, then the beacon stops transmitting, which could cause someone to assume that a tool has been stolen. Many of these issues are likely symptoms of early releases, and as the phone technology matures, I believe these beacons will continue to improve. However, to solve tool tracking today, a more dependable interim solution is important to consider. Rather than relying exclusively on a hardware solution to track tools, many contractors are starting to use an App based on a simple idea. The idea is to build a culture of responsibility so that field workers take ownership for keeping track of tools. By encouraging the field to be more responsible for tools, the company can reduce tool loss and wasted time without putting an expensive beacon on every piece of equipment. Apps that track tools based on “responsibility” don’t rely on a hardware beacon but instead rely on a person-to-person workflow. The App helps a company enforce a “transfer” and “acceptance” of responsibility between workers as tools move from person to person. This is a worker-centric model rather than a hardware-centric model. This model seems to be much more reliable given the current state of hardware beacon technology. What’s going to be really interesting though is when these two technologies come together to create a fully comprehensive tool tracking solution. When and if that happens, contractors will be able to implement a responsibility based system that can track everything in their inventory and then overlay a hardware beacon tracking App for key items on top. This mixed solution is likely going to be the ultimate end game for finally solving tool loss in construction. If you are interested in learning more about the different technologies here are a few of the best ones out there to consider. 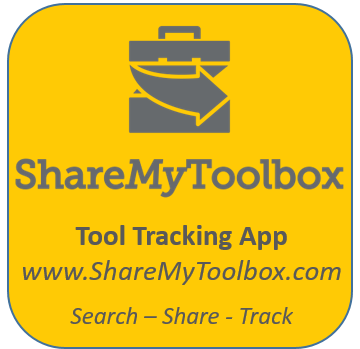 Check out a mobile tool sharing application called ShareMyToolbox®. This easy to use App manages tool inventory with a platform built around tracking the person last responsible for the tool. 1. Someone is always responsible for a particular tool. By digitally tracking who is accountable for a tool, it’s less likely for it to be left somewhere for you to locate. Instead, it will be returned and accounted for at the end of each workday, or by the terms you’ve established with the employee. 2. Searching for and transferring the tool between employees is recorded after the new user “accepts” the tool. 3. Accountability reduces temptation to “walk off” with a tool and serves as a more authentic and reliable theft deterrent. 5. You’ll build a better, more cohesive team around trust and reliability. Milwaukee One-Key – Milwaukee has a line of tools that have Bluetooth beacons built in during the manufacturing process. These are nice since the beacon uses the tools’ power source to deliver a signal – so there’s no need to change batteries. Although remember, if the tool is out of juice then so is the beacon. Milwaukee also has the “tick” which is a Bluetooth beacon you can attach to additional tools that don’t have the Bluetooth already built in. Dewalt – Dewalt has released Bluetooth beacons built into some of their batteries. Once again though, this provides a power source for the beacon but the battery does not always follow the tool, so the tracking can be a little difficult if you have a large number of batteries used interchangeably with different tools. Dewalt has released a stand-alone beacon called the “Tool Connect Tag” which can be added to additional tools. In the groundswell of tool tracking technology, it’s important to keep perspective on the problem you’re really attempting to solve. Deploying a GPS or Bluetooth-driven App is good for discovering where tools have been and sometimes where tools ended up after you realize that they’re missing but these are only realistic for your larger equipment items. For smaller sized assets like power drills, miter saws and sanders being transferred between employees at different jobsites, knowing who had the tool last is the key for deterring carelessness or theft and for creating a business-wide culture of accountability. The different tool tracking solutions on the market each offer practical features and functionality. Decide what you’re trying to accomplish at your business, find the right fit, and leave the stress of losing tools in the dust. More free tool tracking articles are available at Tool Tracking Tips. This includes a tool tracking beacon guide to hardware tracking options. So you want to track tools? Do you start with beacons, rfid, barcodes? Do you need an app or an all in one system? Start simple and build up as you see results. This article talks about how and why to start with establishing responsibility using a simple app.